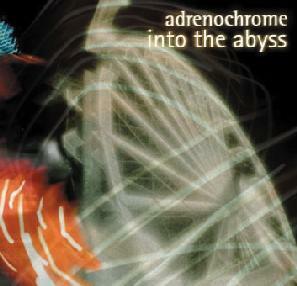 Into the Abyss - "Adrenochrome"
Into the Abyss, now based in Athens, Greece once again, after a stint of a few years based in Frankfurt, Germany, has with 'Adrenochrome' put their live stage show onto disc following three impressive studio albums. 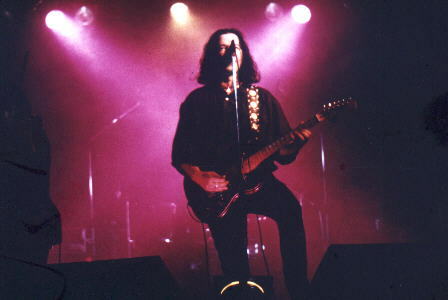 The 12 tracks were recorded from a single performance at the An Club in Athens on the 24th of April in the year 2000. This 72-minute CD is an excellent aural document, showing off the band's flawless and energetic performance by way of a crisp, perfectly-balanced recording. The show opens just as the latest studio album 'Cosmogonia' opened, minus the instrumental intro ("Anshar"). The stunning "Alexandria" is decidedly Egyptian and not in name only... the inspirational sounds of Suzanne Reinhardt's violin come straight to the forefront and are carried aloft on a bed of grandiose pagentry as is the band's trademark. The Middle Eastern ethic continues for "First Rebellion," this time amidst a swaying 6/8 time signature. An older tune (from 'Martyrium'), "Banner of the Fray" features circular arpeggiated guitar licks, the first of many instances that that particular technique is heard (and always nicely done). Next appears the track that first interested me in these Hellenic masters, "The Eternal Heat," another stately tune with a center section of gliding, cosmic guitar from bandleader/vocalist Iannis Kalifitidas. For the pure space rock fans, we have the pulsating and blazing synthesizers (handled by Reinhardt on stage) that fire up the "Lunar Drive," built atop a far more aggressive guitar riff. "In eternal flight my spirit floats... from the gulfs on Time to the maze of Space," Kalifitidas sings in appropriate fashion. (Later in the album, e.g. "Hermanubis," they experiment with some space-electronica flavors, so they're hardly stuck in the past - or for that matter, the gulfs of Time.) Changing gears slightly, Into the Abyss perform a cover of Velvet Underground's "Venus in Furs," and do the tune justice with the eeriness coming from the vocals just as much as the brief snippets of violin. The An Club performance wraps up with two tunes from 'The Feathered Snake,' "La Soeur d'Icare" and an extended "Whirl of the Aeons." My thoughts of "verging on the bombastic" here being a good thing! After all, they're coming to the show's climax - hard to outdo the rest of the set. The on-stage four piece Into the Abyss displays impeccable timing, precision, and dynamic fortitude in stepping up their well-crafted studio works to the live setting. The result is an even bigger, better, and more stirring hour's worth (and change) of music both progressive and cosmic in style. Kalifatidis' voice, which is every bit as 'big' as the accompanying soundtrack it seeks to top, is in fine form here, never hinting at succumbing to the challenging array of vocal exercises he has chosen to attempt. The rhythm section of bassist Mario Lang and Jens Gellner are fully integrated into the overall sound, as opposed to just backup players to the lead instruments. Hence, in many tracks, important counter-melodies and deft drumfills are provided by the two, respectively. 'Adrenochrome' is the strongest work to date by the band, both in performance and song selection (having the advantage of choosing the gems from three quality studio recordings) and is one of my favorite albums of the past year. Given a little bit of word-of-mouth support through a couple different music "communities," I could see Into the Abyss gaining a prominent status among many fans that might be attracted to their progressive, psychedelic, and gothic flavors - either individually or as a collective whole. The CD being a rare Greek import to the bulk of the band's potential audience around the world certainly hasn't helped their cause. So if you are intrigued about what you've read here, I would encourage you to make a special effort to seek out 'Adrenochrome' through more knowledgeable and connected dealers - it would be well worth your while. Fans of Amorphis, Standarte and Kingston Wall I think would particularly catch right onto Into the Abyss. AI: I discovered 'Into the Abyss' through a track that appeared on a cassette compilation on the Music & Elsewhere label. From your extended discography, it seems you've been on a lot of different band compilations around the world. Have you found this technique really works in terms of reaching new fans? IK: To me, appearing on a compilation is like sharing almost the same idea with the other contributors and with the label producing this compilation. It really helps sometimes to reach new people, but this depends also on how popular you already are. AI: When you were based in Germany, you did some touring with the likes of Bevis Frond and Embryo. Do you have similar opportunities to do these types of shows now that you're back in Greece? IK: Yes, we do. 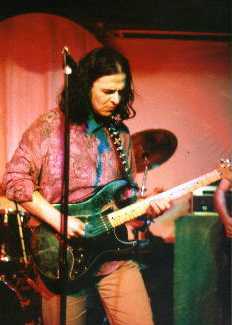 The psychedelic / space rock / kraut rock scene is quite popular in Greece and bands such as the Ozrics, Porcupine Tree, etc. play mostly in sold out houses. In fact, we were supported by Embryo at our last show in Athens. The only problem here is that you can't do a full-length tour, since the scene is concentrated mostly in the two biggest Greek cities, namely Athens and Thessaloniki. In order to tour around the country you need quite strong promotion by the media. AI: I don't know of any other Greek bands to be honest. What is the music scene like in Athens? Are there a number of other psychedelic rock bands that are active? IK: Yeah, as I said before there are a lot of psych and related bands around such as Will O' The Wisp, Purple Overdose, The Limpid Voyage Sound and many more. There are a few fanzines too, most of which I like Gew Gaw. It is published both in Greek and English and comes along with a CD comp through which one can discover the international psych / space scene nowadays, since it features a lot of worthy bands from around the globe. As for the Athenian music scene in general, there are a lot of clubs and venues as well as quite a few radio stations dedicated to rock music. There has always been a huge interest in rock by the Greek music fans. AI: Going forward from 'Martyrium' to 'Cosmogonia' and now the new live album, I can sense a progression from the darker, gothic flavor towards the more psychedelic and cosmic sounds. How has that transition come about, and can you predict how the band might further evolve in the near future? IK: I'm glad you've pointed it out that way. Yes, the band has ascended from the dark abysmal wells (hehe!) into the more colorful sonic maze. I guess it works like this: We've been always listening to a huge variety of music styles. Some of these had an acute influence on our songwriting process. Some others, however, used to lay dormant in the unconscious mind and came to light as soon as time got mature. AI: For 'Cosmogonia's' distinctively middle eastern sound, you broadened the scope of the instrumentation. Are there still other instruments that you've considered adding into the 'Abyss' sound? IK: It depends on the demands of the song. Each instrument adds a particular touch to a song. To me, it is very important to work together with musicians who can add that special flavor to one song or another. This kind of communication means very much to me. It's not that you just work together with a good musician. It's much more than this: It's a sharing of a whole cultural tradition. And this is a very special experience. I'm very lucky being in Athens, since there is a very vivid scene for traditional / world music here with amazing musicians. Greece has always been the place where East meets West. AI: You've chosen a few classic tunes to cover in the past, like the Doors' "Waiting for the Sun" and VU's "Venus in Furs," both of which turned out to be excellent choices for reproducing in your own signature style. Have there been other familiar tunes you've attempted in live shows, or considered? IK: Well, we used to play a cover of Joy Division's "Shadowplay" in the past, but it wasn't as unique as the covers you've just mentioned. A good cover version has to be filtered through your own ideas, that is that the song has to be almost rewritten. I am thinking of doing a cover version on a Moody Blues song from the 'Days Of Future Passed' album, but I can't remember the title right now. It's the one which goes "When the sun goes down...". It has that hypnotic oriental flavor which would fit very well to our sound. AI: Have you made any serious efforts to get 'Into the Abyss' CDs into the American marketplace? Personally, I've found it difficult to locate places that offer your albums, which is quite a shame. Could there be any hopes of arranging a US tour at this stage? IK: Right now I'm not very optimistic as far our popularity in the US is concerned. However, we have had quite some response from the US underground and from diverse tape labels so far. The main problem is that a European product has to be licensed to a US label, in order to be available to the American audience. Otherwise, imported products from Europe turn into high-priced items in the States, mainly due to customs, etc. AI: Until recent years, I would have to admit that I never seriously considered listening to very many bands labelled as 'gothic,' assuming they must be more serious about the image rather than the music. But I've really been impressed with the progressive nature of the compositions you write and the tightness of the performances as archived on 'Adrenochrome.' You've had a consistent lineup in the band for several years now - did it take some time to 'gel' as a unit, especially playing live? IK: Well, the truth is that we've never been a real goth band. Neither our 'look' nor or music has been truly goth. In our early days we were embraced by the goth rock scene and we felt quite comfortable with that, since it used to be a vivid and quite open minded scene. However, as time passed, we realized that this scene developed towards a path which wouldn't fit us anymore. That's how we started moving away from this pigeonhole, since we didn't want to be stuck in stagnant waters. Moving towards new horizons and new sounds is a natural development for a band to which 'restlessness' and creativity is an inner need. Now as far as the lineup goes, there have been quite a few changes, central to which has been me and our drummer, Jens Gellner. It always takes some time to 'gel' as a unit, but as soon as this occurs it adds a liberating feeling to the band and to the sound as well. The band is able to 'move' more free on the stage and to improvise or to try the one or other thing. It's something I'd describe as 'interactive communication'. AI: Gothic-flavored music does seem to have made some impact over here in the states, especially on labels like Cleopatra, and the Projekt label (known for its 'darkwave' bands). Has there been any similar 'champion' of gothic rock in Europe? IK: Well, I don't think that I'm qualified to speak about today's gothic music. However, I believe that gothic-flavored music is an underground phenomenon in Europe, nowadays. There used to be well-known goth labels in the past, but I don't know about the present situation. AI: What led to your decision to leave Frankfurt and return to Greece? IK: The call of the South, hehe! I've never felt comfortable with the rationality of the German society. There comes a time in everybody's life that you have to change something in order to advance. AI: What sort of visual or theatrical accompaniment do you use for your live shows? IK: We use a lot of unique slides and optikinetics, all directed by our light engineer, Katerina Manoussaki. This adds a rather tripping mood to the whole, especially on our extended improvised or ambient parts. AI: Do you have plans for a new studio album in the near future? What's your current status on Cyberdelia - do you have an extended deal with them? IK: Things with Cyberdelia work on a rather friendly basis. Since the label is ran by musicians, the label's motto is 'a label ran by artists'. I do have plans about releasing a new studio album next year, however I'm still not sure if this is going to be another 'Into The Abyss' album or a completely new project. AI: Thanks for taking to time to answer my questions, Iannis! Into the Abyss maintains their own website at http://www2.pair.com/abyss. Cyberdelia Records can be contacted through http://www.cyberdelia-records.com.